The use of diverse terminology may lead to inconsistent diagnosis and subsequent mistreatment of lesions within the proliferative verrucous leukoplakia (PVL) spectrum. 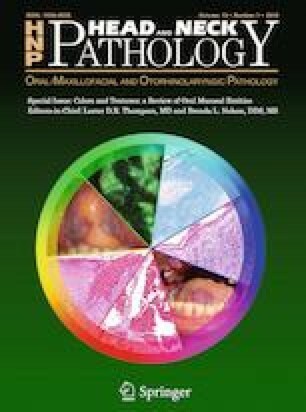 The objectives of this study were: (a) to measure inter-observer variability between a variety of pathologists diagnosing PVL lesions; and (b) to evaluate the impact of diverse terminologies on understanding, interpretation, and subsequent treatment planning by oral and maxillofacial surgeons (OMFS). Six oral pathologists (OP) and six head and neck pathologists (HNP) reviewed 40 digitally scanned slides of PVL-type lesions. Inter-observer agreement on diagnoses was evaluated by Fleiss’ kappa analysis. The most commonly used diagnostic terminologies were sent to ten OMFS to evaluate their resulting interpretations and potential follow-up treatment approaches. The overall means of the surgeons’ responses were compared by Student t test. There was poor inter-observer agreement between pathologists on the diagnosis of PVL lesions (κ = 0.270), although there was good agreement (κ = 0.650) when diagnosing frankly malignant lesions. The lowest agreement was in diagnosing verrucous hyperplasia (VH) with/without dysplasia, atypical epithelial proliferation (AEP), and verrucous carcinoma (VC). The OMFS showed the lowest agreement on identical categories of non-malignant diagnoses, specifically VH and AEP. This study demonstrates a lack of standardized terminology and diagnostic criteria for the spectrum of PVL lesions. We recommend adopting standardized criteria and terminology, proposed and established by an expert panel white paper, to assist pathologists and clinicians in uniformly diagnosing and managing PVL spectrum lesions. This study was presented at the American Academy of Oral and Maxillofacial Pathology (AAOMP) annual meeting in June 2018 at Vancouver, British Columbia, Canada. The online version of this article ( https://doi.org/10.1007/s12105-019-01035-z) contains supplementary material, which is available to authorized users. The authors are thankful to Drs. John Hardeman, University of Florida College of Dentistry; Andrew Salama, Boston University Henry M. Goldman School of Dental Medicine; Bradley Szutz, Alaska Oral and Facial Cosmetic Surgery, Anchorage, AK; Michael McDermott, Midwest Oral & Maxillofacial Surgery, Omaha, NE; Ravi Chandran, University of Mississipi Medical Center, Jackson, MS; George Kushner, University of Louisville School of Dentistry; Eric Fox, Oral Surgey Coral Springs, FL; Michael Langan, Central Florida Oral & Maxillofacial Surgery; Danielle Freburg-Hoffmeister, University of Florida College of Dentistry; and Carl Kimbler, Northern Plains Oral & Maxillofacial, Aberdeen, SD, for their participation in the oral and maxillofacial surgeon survey. All authors declare that they have no conflict of interest as it relates to this research project. All procedures performed in this retrospective data analysis involving human participants were in accordance with the ethical standards of the institutional review board, which did not require informed consent.